Exactly what professional behavior consists of in the context of biological anthropology is something I am currently discussing with our graduate students in a semester-long class called “Ethics and Professional Practice.” My sense is that professional behavior is determined by a set of timeless principles that are easier to appreciate than to specify in detail. A good start can be had if you go to the end of a hallway in the Beckman Center of the National Academies of Sciences & Engineering at UC Irvine. Here, presumably at the request of the eponymous donor, you can read “Beckman’s Guide to Life.” It reflects Beckman’s individual and business philosophy, and it is difficult to argue with any of his suggestions. However, what the list does not include is the need for us all to be generous to the younger members of our profession. That generosity can take many forms. In this blog I will focus on the importance of being willing to share data, but I will also touch on two recent examples of senior figures promoting and encouraging a graduate student. 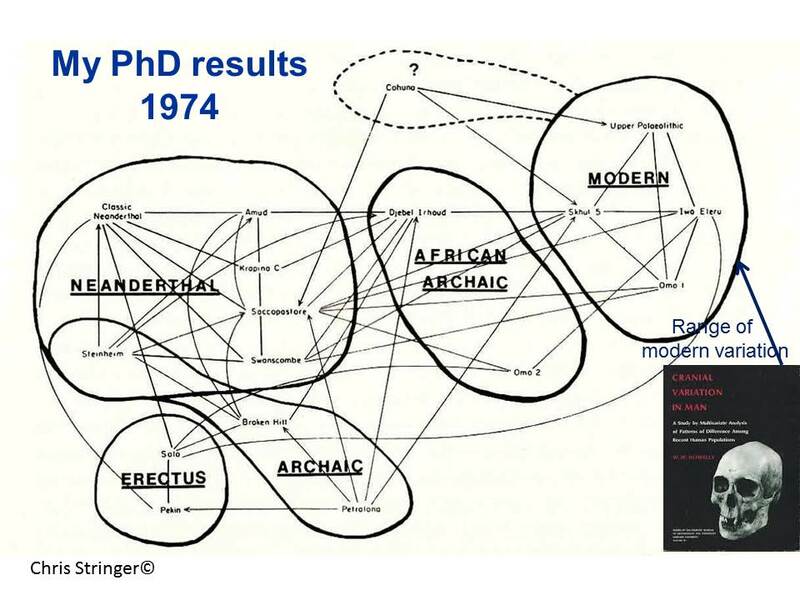 WW (Bill) Howells is one of my heroes, and in a recent review lecture Chris Stringer explained that Bill Howells had shared his modern human craniometric data with Chris when the latter was working on his PhD. In 1971 that involved copying punch cards and sending them by mail from Harvard to Bristol! But my guess is that anyone involved in a graduate program will be able to point to examples of colleagues in other departments being willing to share data with their students – most recently in my case Adam Gordon, Mike Plavcan, Chris Ruff and Matt Tocheri have been exceptionally generous to a student I am co-advising. A few days after attending Chris Stringer’s talk I saw another, particularly impressive, example of professional generosity. If you have only recently completed a PhD, it is tempting to protect your hard-won data. Surely, after all that time in the field, or in chilly museums, the data are yours to mine and exploit. But there is another more compelling argument. First, the data were likely collected because of a grant from a funding agency that probably encourages data-sharing. So do the data “belong” to the person who collected them, or to the funding agency that made their collection possible, or do both parties co-own the data? In any event, the more willing you are to share data the more likely you are to attract potential collaborators, which will lead to more publications. 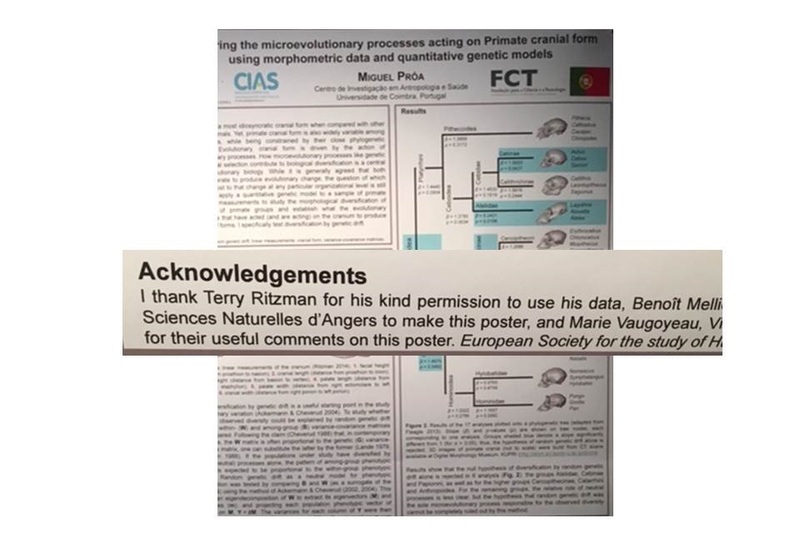 So at one of the poster sessions at the recent European Society for the Study of Human Evolution meeting I was impressed to see a poster acknowledging the generosity of Terry Ritzman1, a relatively recent ASU graduate. You can help students in other tangible and less tangible ways. I was recently in Australia for six weeks, based at The University of Melbourne2. While I was there I met John Furness3, a comparative gut physiologist. I explained that one of our graduate students, Eve Boyle4, has developed an interest in comparative gut morphology, and I put them in touch. John has encouraged Eve, is planning to co-author at least one paper with her, and it was at his suggestion that Eve was invited to talk about her work at a recent conference held in Germany. While at the conference Eve told me about her conversations with Melvin Konner. How he had complimented her on her talk, and how he had taken the trouble to sit and talk with her at the conference dinner. Mel Konner5 is a distinguished scholar who would likely have had his pick of dinner companions, but he chose to sit and encourage the most junior speaker at the conference. In the past year, or so, I have written about behavior that is the polar opposite of the acts of professional generosity I have written about in this blog. It is gratifying to know that professional generosity is alive and well.